Bandwidth management is clearly a complex and evolving concern for most, if not all, network operators around the globe. A recent survey of over 400 European network operators found that blocking of voice-over-IP and peer-to-peer traffic is commonplace today. This survey also identified a very wide variety of traffic management practices, implementation methods and policy justifications. The rapid introduction of new Internet applications and services makes it hard for network operators to predict or robustly categorize uses of the network. Meanwhile, users want their Internet service to ‘just work’. Building on an earlier briefing panel and associated report into the evolving landscape of Internet bandwidth, the Internet Society convened an invitational roundtable meeting of network operators, technologists, researchers and public policy experts with an interest in broadband regulation and deployment. This report documents the Internet Society Technology Roundtable meeting on the topic of bandwidth management that took place on October 11th and 12th 2012 in London, England. At the macro scale there is a good story to tell about new fiber deployments, and more open and competitive cable consortia. However, dark fiber availability is a local concern for some as fiber infrastructure operators seek to provide higher margin services. Content Delivery Networks are part of a larger architectural shift toward localized content delivery and content aggregation services. This shift yields benefits for network users in terms of quality of experience. Content aggregators are helping to meet the growing demand for Internet content but there still remain huge spikes in traffic related to new releases of software and other kinds of popular content that are creating new challenges for network capacity planners and performance engineers. 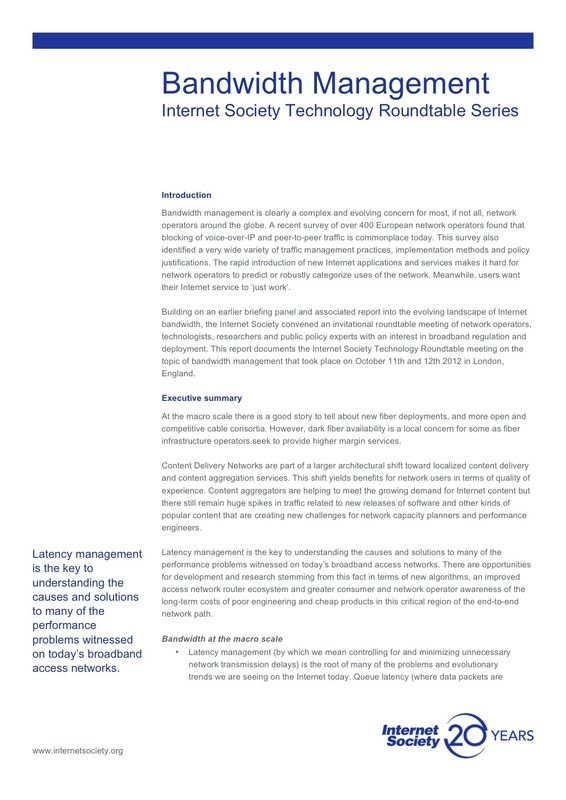 Latency management is the key to understanding the causes and solutions to many of the performance problems witnessed on today’s broadband access networks. There are opportunities for development and research stemming from this fact in terms of new algorithms, an improved access network router ecosystem and greater consumer and network operator awareness of the long-term costs of poor engineering and cheap products in this critical region of the end-to-end network path. Latency management (by which we mean controlling for and minimizing unnecessary network transmission delays) is the root of many of the problems and evolutionary trends we are seeing on the Internet today. Queue latency (where data packets are delayed in the network) is often the dominant determining factor in perceived Internet performance rather than raw bandwidth. Even in the middle of a financial crisis and amidst falling prices there are still investments in new undersea cable capacity being made. Investment in bandwidth is not going to solve performance problems unless latency management issues are also addressed. Constant or increasing rates of traffic growth are commonplace – growth that is not always visible from publicly available sources. Concerns are beginning to be raised about the scalability of the current Internet architecture given the linear growth of core networking interface speeds. Traffic growth rates are not tailing off when looking at individual operator statistics, however, per-user consumption curves are starting to flatten out at the very high bandwidth speed tiers now coming on the market as the bandwidth bottleneck moves to the content provider end of the path. The benefits of middle-box solutions to bandwidth management challenges in mobile networks are short-term and will have trouble scaling as mobile broadband Internet and fixed broadband Internet service definitions converge. We can’t build infinite bandwidth to the edge everywhere. It is therefore necessary to engineer and deploy mechanisms that allow performance to degrade much more gracefully than is typically the case today. Better architectural support for technical collaboration between network and content aggregators and application providers to deliver more network and application management data is a high priority. Novel solutions for both per-customer bandwidth management and per-flow bandwidth management are on the horizon. Specifying a latency-under-load test is one very concrete step that will help root out network paths that have bufferbloat-related problems. Separating software from hardware in the Customer Premises Equipment (CPE) business is highly desirable. Creating open and modular CPE software platforms, like OpenWRT , will help to remove the CPE software as a bottleneck on progress and innovation. Openly specified testing with network operator input, coupled with certification programs could help to improve CPE quality. Growing awareness of latency management problems and promising, partial, solutions give some hope but deployment of major technological upgrades will always be a challenge for a large distributed system like the Internet. Deployment challenges for such new mechanisms are severe and a focused effort to radically improve the quality of the network edge seems necessary to make improvements in this regard.